Do you have a silent killer in your home? Carbon Monoxide Poisoning can be deadly for you and your family. It is a colorless, odorless, poisonous gas that can be produced when ANY fuel is burnt, including oil, gas, wood, or coal. As the heating season is fast approaching now is the time to get educated and take the necessary precautions to keep you and your family safe. Carbon Monoxide (also known as CO) is a colorless, odorless, poisonous gas and is a common yet preventable cause of death from poisoning worldwide. It can be produced when there is a lack of air when fossil fuels are used or if an appliance is faulty. Carbon monoxide is emitted when materials burn. It’s a natural byproduct of gas and propane powered furnaces, wood-burning stoves, non-electric space heaters and gas or propane stoves and ovens. Vehicles also emit the gas, which can build to deadly levels if trapped in a garage or other closed space. Household appliances that produce carbon monoxide should be equipped with ventilation systems that keep the dangerous gas from accumulating in your home. The trouble arises with aging appliances that can break and emit deadly gas into your home’s interior. It is important to remember that a match, cigarette, or incense give off CO, not just appliances. Early symptoms of carbon monoxide poisoning are often mistaken for the flu. It’s important that if you start to notice some of these symptoms, especially if they become chronic, you go to a doctor right away. Keep all appliances in good working condition. Have them maintained regularly or serviced immediately if you notice them malfunctioning in any way. If you have a chimney or flue double check it is clear and free of any blockages. Make sure all rooms are properly ventilated. Do not run any vehicles or gas powered machines in an enclosed environment. (Like a garage.) Be sure to have Carbon Monoxide Alarms installed in your garage as well as within 15 feet of entrances to sleeping areas. Stay safe this winter! If you have any questions or concerns on your heating equipment call us at Apollo Heating and Air (509) 987-1500. We are here to serve you and the community, providing the highest quality of service. 1/2 Way Through September Already!! Can you believe that fall is right around the corner? If your goal is to keep your home comfortable through the season changes and your HVAC equipment working in peak operating condition, you need to make sure to schedule a fall maintenance. Just like changing your oil or rotating your tires on your car, it is important to have a seasonal check to ensure your system is prepared to function successfully and efficiently. Check Thermostat – This ensures that it is functioning properly. If you do not have a programmable thermostat, your technician may recommend making the upgrade. This will help maximize your system s efficiency and save you money. Inspect Electrical Connections – Faulty electrical connections and incorrect voltage affect the equipment’s efficiency and safe operation, and increase the risk of a component failure. Lubricating All Moving Parts – A lack of lubrication on moving parts like fans and motors leaves them vulnerable to friction which can result in significant damage. Not only does friction decrease efficiency, can cause increased wear and increase the risk of fire. Cleaning the Condensate Drain – If dirt builds up and blocks the condensate drain, indoor humidity levels will rise, water damage may occur and bacteria, mold and mildew can flourish. Testing the Start-up, Shutdown and Safety Controls – Checking these functions that all the system will run safely and is operating correctly. Inspecting the Exhaust Vents – Checking the systems chimney or vent stack for leaks, corrosion and back drafting is vital to prevent buildup of exhaust fumes such as deadly carbon dioxide. Checking the Heat Exchangers, Burners, and Fuel Lines/Connections – Dirty burners, fuel leaks, and damaged heat exchangers impact energy efficiency and pose a serious safety risk. Cleaning or Replacing the Air Filter – In between professional tune-ups, check and clean/replace the filter monthly to keep the HVAC system operating efficiently and prolong the equipment’s service life. To learn more about the importance of preventative care, or to schedule a fall HVAC maintenance visit, contact us at Apollo Heating and Air Conditioning. Call us at 509-987-1500 or schedule on line by clicking here. Recent accomplishment outside the job: Laid sod at my house. Thanks Tanner! Favorite Music: Anything from Pharrell’s “Happy” to Vivaldi’s “Four Seasons”. Next big goal in life: Try to get ahead of the projects at the house. We all knew it was coming… WARM temperatures. With a lot of summer left, there’s still time to replace your old Air Conditioning system! Did your Air Conditioner have a hard time keeping up with the high temperatures last summer? Did it run continuously? Did you have fans going in rooms that you just couldn’t seem to keep cool? 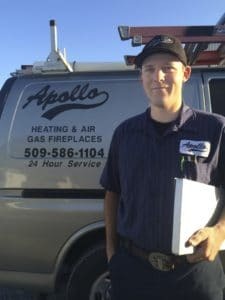 Apollo Heating and Air Conditioning trained Service technicians can maintain your current system and make any necessary repairs. If your system needs to be replaced, Apollo Heating and Air Conditioning offers free in-home estimates, and can provide you with several options for replacement systems. Need financing? We offer several options for that, as well. Don’t let the high Tri-Cities temperatures put a damper on your summer enjoyment. Call Apollo Heating and Air Conditioning! (509)987-1500. Recent accomplishment on the job: Completed all start-ups at WSU FOB. Recent accomplishment outside the job: Purchased 3.5 acres w/ house and shop 18 miles N. of Pasco. Next big goal in life: Finish pasture, irrigation and yard. Keep Cool Air In & Hot Air Out! June has arrived and it is officially hot in the Tri-Cities! While we love the hot weather outdoors, we all would prefer for the heat to stay where it belongs, OUTSIDE! Our homes and businesses are our escape venues from the heat. It is important to keep these areas cool and refreshing. How do you accomplish this without breaking the bank you ask? Here are some tips to help keep the cool air indoors and the hot air out! Take the time to seal around your unit and seal your ducts then wrap the ducts in insulation. If your ducts run through an attic space it would be beneficial to insulate there as well. Sealing and insulation require a certain amount of effort but will be well worthwhile in energy efficiency both summer and winter. Seal around windows, doors and baseboards. In some cases replacing old windows with double pained energy efficient windows is necessary for a complete seal. Close your windows and drapes during the day to exclude the hot air; then open them at night to ventilate your home. You may wish to install interior or exterior blinds, shutters, shades or awnings, particularly on south- or west-facing windows. Additional energy effective window treatments such as reflective films and insulated panels are available as well. Reduce the heat that is generated inside your home by using your electric clothes dryer during cooler hours (or the old fashion line drying!) and cooking at off-peak times. Utilizing your barbeque and microwave can drastically reduce the amount of unwanted extra heat indoors as well. If you follow these simple rules you can help alleviate extra stress on your system while still maintaining comfortable temperatures indoors. It is our goal at Apollo Heating & Air Conditioning to provide you with all the tools necessary to keep your HVAC system running optimally. If you have any questions or concerns please give us a call @ 509-987-1500. We are here to serve you, let us know how we can help! Stay cool. As the temperatures begin to steadily increase so does our desire to spend time outdoors in the beautiful sunshine. Family gatherings move from sit down dinners to afternoon barbeques, and movie dates turn into afternoons spent poolside. While we all love to work on our tan’s and feel the calming warmth of the summer sunshine, it can be dangerous for our health if we don’t take the necessary precautions. This is especially true for our fellow workers that must work outdoors in the extreme Tri-City summer heat. So what precautions can we take to help reduce our risk of heat related illnesses? Drink plenty of water, non-alcoholic and decaffeinated fluids. Your body needs water to keep cool. Drink plenty of fluids even if you don’t feel thirsty. Do not drink alcoholic beverages and limit caffeinated beverages. During excessive heat periods, spend more time in air-conditioned places. Air conditioning in homes and other buildings markedly reduces danger from the heat. If your job requires you to remain outdoors, use your vehicle’s air conditioner for a few minutes to cool down. Allowing our bodies the opportunities to cool down is imperative to keeping us safe. Whether we are working or playing in the heat we must take the extra 5-10 minutes to hydrate and retreat to an air-conditioned space. Having a healthy working air-conditioner is imperative to make this possible. This time of year keep a close eye on your homes system and make sure you have the necessary maintenance completed in time for the blistering summer months. Call us @ Apollo Heating and Air Conditioning to schedule a maintenance or provide a quote for a new system. 509-987-1500. We love keeping your HVAC system happy and you and your family cool and safe. Who knew a thermostat could be so important? Did you know that they control half of your homes energy? That’s more than appliances, lighting, TVs, computers and stereos combined. I KNOW, it blew me away too. The Problem: If your thermostat isn’t programmed, you could be wasting around $150+ a year. By programming your thermostat you could save yourself 20% on your heating and cooling bill. But many of us don’t program our thermostats. Why? Well let’s face it they can be too complicated. Who has time? The Solution: Keep it simple. Choose Nest. Nest saves energy automatically. All you need to do is change the temperature for a few days to teach Nest. After that “Nest Sense™” learns about you and your home and starts activating features to save you more energy. Most people leave the house at one temperature and forget to change it. So the Nest Learning Thermostat learns your schedule, programs itself and can be controlled from your phone. Yes this thermostat is WiFi capable. Control your home’s temperature from your laptop, smartphone or tablet. Make adjustments in real-time, miles from home. Save while you’re away. With Auto-Away™, the Nest Thermostat automatically turns to an energy-efficient Away temperature when you’re gone. Auto-Away works in 90% of homes, even if your Nest is in a spot you don’t pass on your way out the door. It tracks the weather in your area; Nest uses its Wi-Fi connection to keep an eye on current weather conditions and forecasts so it can understand how the outside temperature affects your energy use. 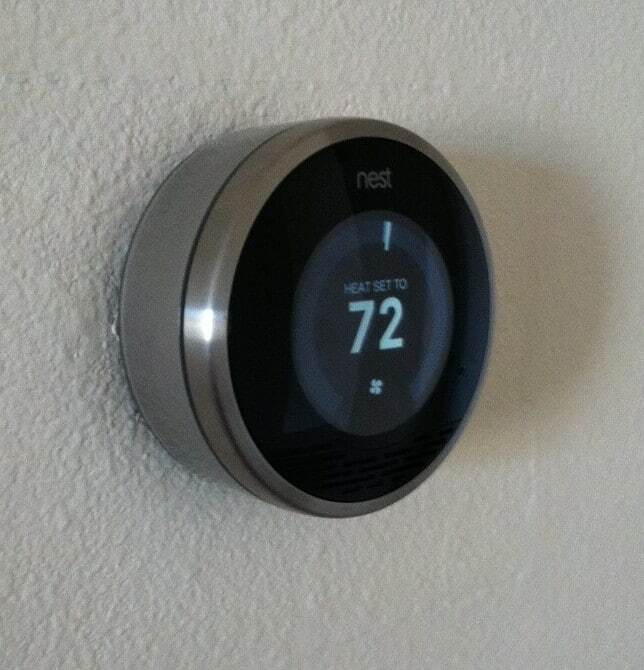 It also has a leaf icon that registers on your Nest display. The Nest Leaf appears when you are saving energy. Awesome right? Changing temperature just one degree can cut your energy use up to 5%. The leaf is designed to guide you in the right direction. These are just some select features Nest offers you. For and in-depth look at all features that Nest offers please click here. Nest knows one size doesn’t fit all. So you tell Nest what system you have and System Match will turn on specific features to keep you comfortable and help you save. Teach it well and the Nest Thermostat can lower your heating and cooling bills up to 20%. We at Apollo Heating and Air Conditioning make it our priority to keep you comfortable at the most affordable price. Contact us to have one of our Nest Certified Technician’s come out to your home and install the next generation in thermostats. (509) 987-1500. Nest is the future and it is here now. Let Nest give you the comfort you deserve while keeping up to 20% of your energy bill in your pocket. It is important to have these inspections to prevent problems before they occur, assure long life and energy savings for your system. Keeping your system clean and maintained will help all parts run more fluidly and prolong their lifespan. If a problem is developing, a technician can catch it early, the result can help save you from a costly repair later on. The more efficiently your system runs the less energy it requires; in turn keeping more money in your wallet where it belongs. Please take the time to schedule a maintenance and keep your system happy, healthy, and ready for the extreme summer months ahead. 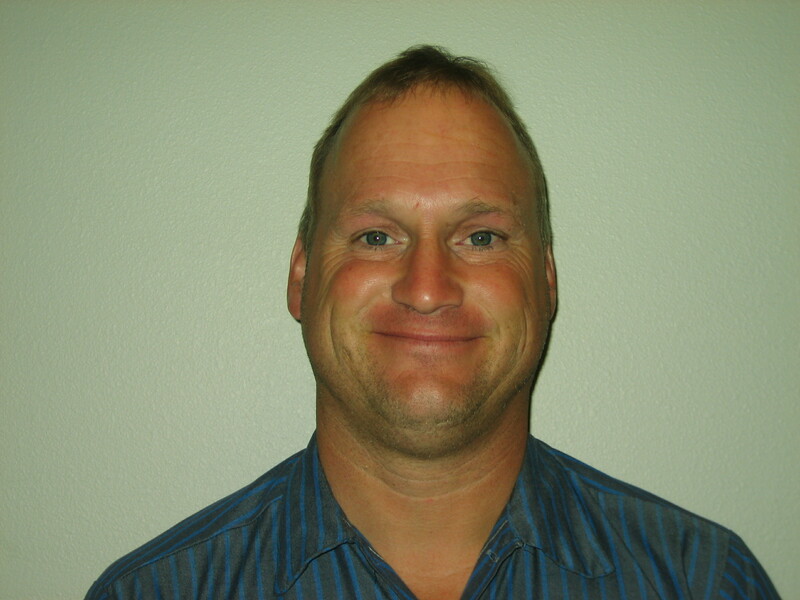 To learn more about our Planned Service Agreement and to schedule a maintenance with us click hear or call us at 509.987.1500.